Two large sticks of Korean style BBQ pork belly. If you are unfamiliar with pork belly it is the raw stuff of bacon. A BBQ slab of it comes out as a huge, succulent slab of bacon. My tasty sticks were juicy and disappeared far too fast! They are served on top of a bed of brown rice and some good veggies, zucchini and red peppers in this case with what I believe was a light aioli as a sauce. I'm a little picky about my rice, but I've never had anything put great rice from Stick It, always tender but still with a little nutty chewiness that brown rice should have. 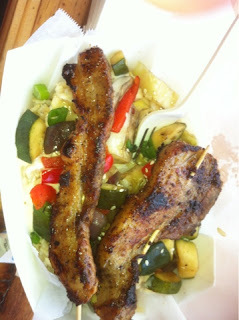 Synopsis: One of the most satisfying and filling food truck dishes in Houston. My lovely fiance had the beef tenderloin on my recommendation (previously reviewed), she raved about how tender with was. It was served much like the pork belly with the addition of chimichurri sauce. While waiting for my order and chatting with my fellow mobile foodies one guy got the locally smoked sausage on a stick. It was two large sausages on a bed of chipotle mac and cheese. It looked totally decadent and I was ready to ask if I could change my order for it. I will be looking for that next time I find Stick It parked nearby.